THE MIDNIGHT VINTAGE CLUB OPENS AGAIN! Il Sito delle Donne6 September 2018Comments Off on THE MIDNIGHT VINTAGE CLUB OPENS AGAIN! The saturday night fever at the Midnight Vintage Club! From October Saturday 13th, all Saturday nights, only vinyl records! The AbanoRitz dance floor opens again with 60s, 70s and 80s music for a throwback to the evergreen, in a special and exclusive location under the hotel swimming pool which can be seen through the portholes! According to Wikipedia the word vintage comes from ancient French vendenge referring to the ancient and valuable bottles of wine. Therefor the term was initially used for the wines produced in the best ages and then it became synonymous with the word: VINTAGE. Later on it was used also for other objects in: fashion, costume, taste and design. In general are defined vintage objects that even tough were produced many years ago still preserve: functions, characteristics, charm and quality that are superior to the ones of the objects that are produced nowadays. The objects that are defined “vintage” are for some people cause for cult for many reasons: the value ore the quality of something that was manufactured years ago or because the object is bond to some special culture. The word vintage assumes so the meaning of “beloved in the past” and the rediscovery of an ancient object, with a story and a past, that can be used again in the present gives a new importance to the idea of the present. It is not possible to trace the history of the vintage: it’s the vintage itself to trace it; is the past that has never been so present. It is a real philosophy that anyone can live with the reborn of a domestic and cultural background which all began with the intellectual artist Andy Warhol, or with the Italian architects or designers Magistretti and Castiglioni who rework the most significant ages past in a creative way: mixing them with modern and contemporary. In the early 70s, the engineer Luigi Poletto who had just built and opened The Hotel Ritz in Abano Terme, in the center of Veneto; decided to build a bowling alley right under the swimming pools of the new hotel. A visionary, an innovator who always looked further: first mechanic and then technology, a fascinating man who was fascinated by everything that was new and experimental! A bowling like you’ve never seen before….4 alleys! After a trip to Morocco, the eng. 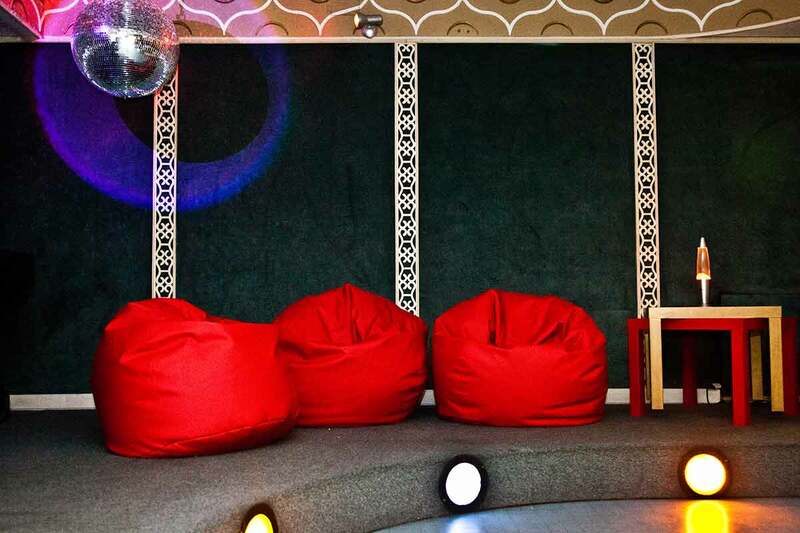 decides to complement the bowling alleys with a tavern, similar to a “lounge bar” with all the Arabic atmospheres and all the Moroccan objects that ho brought home. In the 80s the Saturday fever breaks out and so the engineer dismantles the bowling and extends the tavern under the swimming pools with the portholes in order to create a real dance floor and this leads to a night club: the BABY NIGHT of the Ritz. The place was fun: people dancing and partying till early morning. Young people and old dancing: the geghegè, the watussi, the twist, the tuca tuca, the limbo etc…. With time trends change, people are getting more tired on the inside than on the outside, there is less enthusiasm and less desire to have fun and all this together shuts down the Baby Night of the Ritz that meanwhile has become AbanoRitz and has gained its fifth star. At the end of 2013, close to the fiftieth anniversary of the hotel, the daughters of the engineer decide to relive that extraordinary place with a straight idea in their mind: invest and produce not just business but also values, to take back the past to create a better future, originality and exclusivity, relax and fun. They readapt and reopen the Baby Night, only vinyl records…almost 5000. Only on Saturday. The Midnight Vintage Club: 300 song every night between 33s and 45s, two STANTON paddles, ORTOFON Concorde styluses, two big Wharfedale Pro speakers, but most of all an American Audio Mixer console beautifully used by DJ Federico Rorato: DJ BEEP.